Manchester is an absolute treat when it comes to places to eat. From high street to high end, to chain restaurants and your little independents. No matter what your budget, or your taste, you can find something to eat within strolling distance. 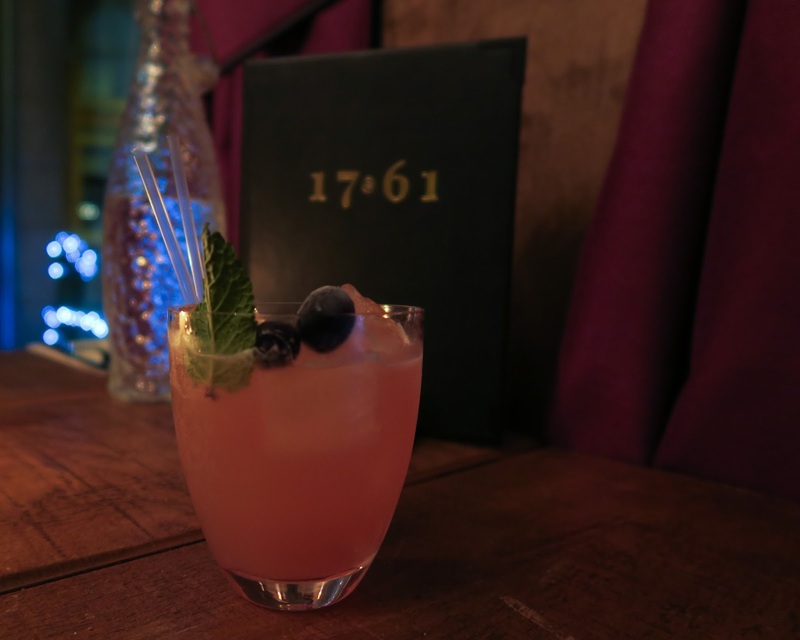 One of the latest eateries to hit Manchester, which actually ticks a few of the boxes above is 1761 Restaurant. Not only does it oooze a high end feel, but it is also independent and is pretty reasonable prices as well. With a Manchester theme throughout, you are welcomed by the large bee on the door handles at the main entrance. As you step in to the restaurant you are led to your seat by incredibly friendly staff, and as you sit down you are instantly at ease as you peruse the Manchester themed menu. On the menu you will find dishes inspired by the area. From cockles (and muscles, alive, alive oh!) to corned beef hash and Three Rivers Gin battered fish and chips, its British eating at its finest. Everything has a slight twist, such as the Manchester Tart for dessert. Expecting a dainty pastry and classic jam and custard in, I was actually served a delectable version topped with coconut and served with a zesty ice cream. My personal favourite from the dishes we tried we the ‘frickles’ – which are deep fried pickles. The texture perfect, with the crispy batter against the softer pickle center. Although saying that, all of the starters we tried could have been eaten again and again, as they were absolutely delicious. I’d never even had a cockle before, as I assumed they’d be like eating little ears. But nah, I was wrong. The 1761 cockles, which have been marinated in some kind of salt and vinegar seasoning, were pesky to get on the fork, but satisfying once you got a mouth full of them. For my main I chose a lamb shank, which is something I usually wouldn’t have gone for. But the Polenta and Pine Nuts captured my intrigue and it’s safe to say I will definitely be choosing lamb more often. The meat melted from the bone and the lime pesto added a tasty twist on a classic. A Manchester theme is not only prominent across the food menu, but you will also have a little lol at the names of some of the drinks, such as ‘Our Kid’ ‘Tropical Oasis’ and ‘This is the Place’ – all very delicious in their own right as well. As mentioned, the prices are pretty reasonable. You will find the snacks and starters begin at around £5 and main courses will set you back on average £10-£16, with only a few stretching above that.